The Giant Sun Polyp, with its broad oral disc, is said to be the largest of the Zoanthids! The Giant Sun Polyp Protopalythoa grandis, also known as the Sun Zoanthid, is a very attractive button polyp. They have a mottling of brown, white, and green colors. They can also be somewhat iridescent, and occasionally have wagon wheel type striations. Like all the members of the Protopalythoa genus, and they are one of the largest Zoanthid species. But with an oral disc reaching 2" ( 5 cm) across, the Giant Sun Polyp is believed to be the largest of all. Whether these are Protopalythoa genus or the Palythoa genus is in a state of confusion. At one point these were members of the Palythoa genus, but then they were distinguished by their growth form and placed in the Protopalythoa genus. However, some experts again consider this genus to be part of the Palythoa genus. Which genus the scientific community as a whole ultimately settles on is yet to be seen. What mades the Protopalythoa genus unique is that they most often grow as solitary polyps, though often in small tightly clustered groups. The Palythoa sp. have been distinguished by polyps that are connected through a mat, called the coenenchyma. The Paly's incorporate bits of sand or sediment into the mat giving the colony the appearance of a half moon large coral. The polyps of the Protopalythoa sp. are not usually embedded in the base of a mat. They are also larger, and generally have more tentacles around the rim of their oral disc than the Palythoa species as well. The Giant Sun Polyps are easy to care for as long as they have proper lighting and water flow, and adequate nutrition. They are found in the Atlantic Ocean where they inhabit the deep hard bottom reefs of the Gulf of Mexico. Since they are found in deeper water, they like lower lighting and a moderate water flow. Place them at the bottom of the aquarium for lower light. They also need a medium current, but not too strong since they catch prey from the water column, and this would make it very hard for them to feed. If the Giant Sun Polyp doesn't get enough food their polyps will shrink slightly. The tentacle will also recede making them look more like a sea anemone similar to some of the Discosoma genus. At times they close up for several days to shed mucus, which is thought to help rid the zoanthid of sediment and algae. They can also take about a week to adjust and open in a new tank. Filamentous algae can be a problem, as it can smother them. As with most zoanthids, mushroom anemones should not be placed nearby. The Protopalythoa sp. are recommended as a beginner's coral, but with some caution. Protopalythoa produce palytoxin, one of the most potent poisons known to science. For this reason one should take care when handling them. Don't handle them if you have cuts or open wounds and make sure to clean your hands after handling. Distribution / Background Protopalythoa Coral Information: The Protopalythoa genus was described by Verrill in 1900. It was once part of the Palythoa genus. The taxonomy of the Zoanthids has been very difficult and though some species are described, it is still largely speculative. This is partially due to the immense variety of colonies and polyps found in nature; and also because they are non-calcifying, the animals lack skeletal characteristics. As more is learned over time, we can expect to see more revisions, especially at the genera level. The taxonomic status of Palythoa and Protopalythoa has been in question for almost a century. Separating them into two separate genera has been based on traditional morphological methods such as the polyps form and colony, the size and form of their nematocysts, and the number of septa. The distinguishing features for Palythoa species is that the polyps are embedded in a well developed mat, known as the coenenchyme, while the polyps of the Protopalythoa species are most often solitary rather than part of a well developed mat. There are a number of species seen in the Protopalythoa genus, but most are unclassified. Some of the more common species found in the Pacific include P. mutuki, P. toxica, P. variabilis, and P. vestitus; and from the Atlantic include P. grandis and P grandiflora. Some common names they are known for are Zoas, Zoanthid, Sea Mats, Zoanthid Button Polyps, Giant Palythoa, False Anemones, False Coral, and Button Polyps. Where Protopalythoa Corals Are Found: The Protopalythoa genus are common in both the Atlantic and Pacific Oceans. Protopalythoa Coral Habitat: The Protopalythoa sp. habitat includes reef slopes, hard bottoms, and sandy reef flats in various water flows and depths. Status The Protopalythoa genus is not on the IUCN Red List for Endangered Species. Description What do Protopalythoa Corals look like: The Protopalythoa genus have soft bodies covered with a leathery skin, called the cuticle, which gives them protection. What makes the Protopalythoa genus unique is that they most often grow as solitary polyps, though often in small tightly clustered groups, and their polyps are not usually embedded in the base of a mat. They are larger polyps with fewer tentacles than most other zoanthids. Their colors can be cream, coffee, white, brown, or yellow, as well as other shades. Too much light can cause a uniform tan or brown color, so lighting is important to experiment with if you want to pull out more green. The tentacle size and shape of the Protopalythoa may vary as well. They are found in various water flow rates which results in varying physical features. For example, the stocky and short polyps with tentacles that stay the same size from base to tip (non-tapered) are from high water flow areas, such as P. grandis. The tentacles of some species are short and knob-like, while on others they are thin, long and tapering, such as P. mutuki. The Protopalythoa genus is similar to the Palythoa genus, but the polyps of the Protopalythoa are larger and generally have more tentacles surrounding the rim of the oral disc. This Zoanthid, found in the Atlantic, is one of the largest of the Protopalythoa genus. They have mottling of brown, white, and green. They are found in the deep hard bottom reefs of the Gulf of Mexico. Since they are found in deeper water, they like lower lighting, so place them at the bottom. They also need moderate currents, but not strong since they catch prey from the water column, and this would make it very hard for them to feed. At times they close up for several days to shed mucus, which is thought to help rid the zoanthid of (sediment and) algae. They can also take about a week to adjust and open in a new tank. (It has been suggested that it may be a synonym of Protopalythoa variabilis). This Zoanthid, found in the Pacific, has large polyps that are green with a white mouth. They can have a little brown in them and turn tan to brown if the lighting is too intense or not to their liking. These are found inter tidally on rocky shores and reef flats and do not like strong water flow. This is also a Pacific species, and it has the highest level of palytoxin. They have brown and white mottling on their oral disc and the edges are curled up most of the time. They can tolerate a stronger water flow. Found in the Pacific, it has brown polyps that are connected at the base by stolons. They feed at night on zooplankton and other particles in the water column. They will bury themselves in the sand part way and like a quiet water flow. This too is a Pacific species. It has delicate tentacles that are rounded on the outside edge of the deep brown oral disc with white radiating from the center. They form large colonies as opposed to solitary individuals. This is a shallow-water species that prefers strong lighting and strong water flow. At times, they will shed a mucus layer from their base. This Zoanthid, found in the Atlantic, has brown discs with lighter tentacles and they form smaller colonies that are connected by stolons. They are not too picky about light and water movement. Difficulty of Care Protopalythoa Coral Care: The Protopalythoa genus is easy to care for as long as they have adequate lighting and good water flow. That being said, too much light can cause a uniform tan or brown color, so lighting is important to experiment with if you want to pull out more green. Be cautious of filamentous algae as it will overgrown and smother polyps. They are a recommended beginner's coral, but with some caution. Protopalythoa produce palytoxin, one of the most potent poisons known to science. For this reason one should take care when handling them. Don't handle them if you have cuts or open wounds and make sure to clean your hands after handling. Foods / Feeding Protopalythoa Coral Feeding: In the wild, Protopalythoa corals have developed several feeding strategies. Through a symbiotic relationship with a marine algae, known as zooxanthellae, they receive the majority of their nutrients. They also capture planktonic organisms and microscopic food particles from the water column, and can absorb dissolved organic matter. In captivity Protopalythoa sp. depend on their zooxanthellae for some of their energy, so will need bright lighting to supply this type of nourishment. They are always willing and eager to take meaty offerings that are appropriate to marine life. You can give them any fish or crustacean flesh as you feel they need it. Mince the pieces so they can digest the meat. If the Giant Sun Polyp doesn't get enough food their polyps will shrink slightly and their tentacles will tend to recede. Aquarium Care Stable tank conditions are needed to keep the Protopalythoa genus. Doing water changes of 20% a month or 10% biweekly is needed, although it is suggested that doing 5% water changes once a week will replenish many of the needed additives. Make sure iodine is present, and also the addition of trace elements may help with Protopalythoa survival. A typical live rock/reef environment is what is needed for your Giant Sun Polyp, along with some fish for organic matter production. A mature tank (well over a year old) is advised to increase the successful keeping of Protopalythoa. Provide proper lighting and water movement. Moderate water flow and a strong light source are required for Giant Sun Polyp to do well. These colonial anemones are not an aggressive species. They get along well with their own kind, but space should be provided between them and other corals as they are fast growers and will overtake close neighbors. Compatibility and Social Behaviors The Protopalythoa genus will get along with itself, but does need to be placed in an area where they will not encroach on nearby corals. They are toxic and will damage some soft corals and most of the stony corals. Both the Protopalythoa and Palythoa genera can be grown next to each other without incident. Giant Sun Polyp are not an aggressive species. They can be kept in the company of small peaceful coral reef fish and shrimp, and hermit crabs. Other good tank mates include small tangs and blennies that will feed on filamentous algae. Avoid large crustaceans, large angelfish, and most butterflyfish. Sea Anemones and Tube Anemones should also be avoided. Breeding and Reproduction The Protopalythoa genus has a reproductive cycle of spawning along with other corals. This is an amazing event. It has been seen in the Great Barrier Reef during the week after there is a full moon in the month of November (Ryland & Babcock, 1991). They can be hermaphrodites or separate sexes. The sperm and egg meet and then form a larva that swims, called Zoanthina (Delbeek & Sprung, 1997). They will also reproduce by budding. Propagation is rather simple for Protopalythoa corals, simply cut the mat or chip away under the polyp's grip. They can be out of the water a few minutes with no ill effects. Dry the bottom of the mat or debris that the polyp is stuck to, and the rock or plug you will be putting it on. Then use super glue (the gel is the best) to connect them. Wait a few seconds for it to set and then put the new frag back into the water. Another method that can be used is to rubber band them to a rock or desired surface. By the time the rubber band breaks away, the zoanthid will have connected. 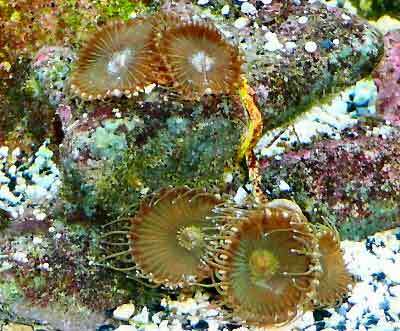 Potential Problems The Protopalythoa genus is generally hardy and durable if provided with a proper reef environment. However be cautious of filamentous algae as it will overgrown and smother polyps. A snail called the Box Snail or Sundial Snail Heliacus areola preys on Zoanthid colonies, so must be removed if seen. There is a sea slug from the Aeolidiopsis genus that feeds on Palythoa, so most likely on Protopalythoa as well. Also avoid large crustaceans and aufwachs feeders, such as large angelfish and most butterflyfish, that like to nibble on their tentacles. Availability Protopalythoa Corals for Sale: The Protopalythoa genus are very easy to find at pet shops and on line. Online they can run about $35.00 up to $80.00 USD or more for a small grouping, depending on the color and size.